The bout between Mayweather and Pacquiao was extremely BORING. It seems to me now like daylight robbery when you consider how much people had to pay to watch this rather dull affair. Maybe it is because this is a welterweight fight and not a heavy weight fight, but I was far from sitting on the edge of my seat for a fight that was billed the "Greatest match of our generation". Money Mayweather may be undefeated and all, but he is far from being an exciting boxer. I think he is far more concerned about preserving his win-loss record than about actually going out there and giving people something to cheer about and remember. He is far too guarded - basically, his game plan is and seems to have always been, to do the least thing possible while in the ring, avoid getting knocked out, and coast on to victory. And in many cases, that has worked for him. But as far as I am concerned, this sort of boxing is not something that makes you a name that folks will remember ages to come. If you want to be the greatest, you have to be willing to step out of your comfort zone and give people a performance that they'll remember; a performance that will undoubtedly cement your pugilistic prowess in the minds of many. This cowardly way of winning by doing nothing and waiting for your opponent to exhaust himself or commit errors doesn't impress me one bit. Yeah, you made your millions, but I have seen more formidable boxing action on Worldstar. As for Pacquaio, for all his vaunted skills, the dude seemed to lack the intensity and the drive that most people remember him by. They say it was because Floyd had a longer reach, but we know smaller boxers have destroyed larger opponents before. I think Pacquiao is not as formidable as he once was and it was plain to see. In any case, they both walked away with huge paydays last night, but they left me and millions of boxing fans massively underwhelmed. 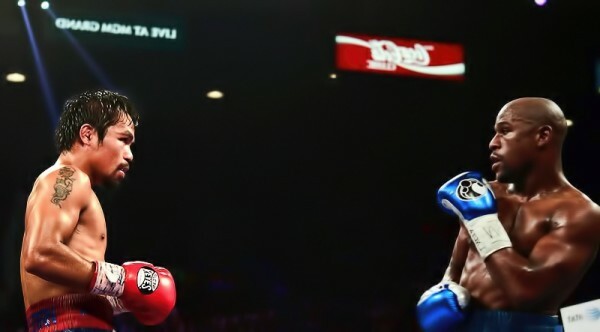 In the end, professional boxing is a business, and I suppose boxers these days have probably figured out that they do not really need to go all out giving their 100% and possibly giving each other long-lasting head injuries in the process. All they need to do is act like bitter enemies, sell the hype of some ferocious bout, draw as much money and support as they can, and basically walk home with huge paychecks after putting up an overly cagey or guarded performance. Maybe the joke is on all of us. Maybe gone are the days when boxing was a real knock-down, drag out affairs. Indeed, this bout seemed like a real waste of time and money. I had the opportunity to watch this fight, but opted out at the last minute. I'm now glad I chose sleep! Everyone I've spoken to share the same thoughts as you. The fight was overly-hyped and I considered waking up at 5am to watch this match - thankfully for me, my alarm failed me. I think I've learnt my lesson. I'll never spend money or stay up late at night for welterweight boxing ever again. If this is the new face of welterweight boxing, I'm far from impressed and I think i'm better served ordering pay-per-view wrestling instead. At least they know how to package and present a suspenseful and entertaining show.